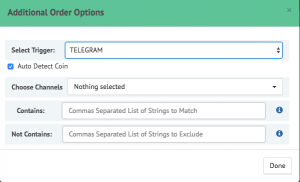 Home / Understanding Order Types / Automate trading by capturing telegram signal. TrailingCrypto keeps track of popular telegram channels which provide either trade signal or tips. In channels like Trading Crypto Coach, it is observed that as soon as trade signal appears on the channel for a coin, the coin price suddenly soars after few second. Some time such price surge could reach up to 30-40%. Such signals commonly pump signals. Usually, we observed many of times traders either miss the important signals or take too much time between signal and placing the corresponding order on the exchange. Such dealy greatly diminishes the opportunity to make a profit. In fact, sometimes such delay leads to losses. This leads to the idea, why cannot be telegram signal could be captured and automatically place a corresponding order. This what telegram trigger is all about. TrailingCrypto keeps eyes on the most popular public channel which provide signals regularly. Once it captures new signal, it immediately triggers the telegram signal orders related to that channel. Usually, delay between the signal on the channel and final order execution in less than one sec. Follow the below steps to place telegram signal orders. 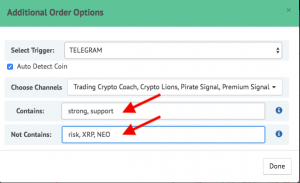 Select the order which supports telegram signals. Supported orders Market Buy, Trailing Buy, OSO, Instant buy. Press on the trigger button in bottom right of the order form. This will pop up a new window. Now select telegram from the drop down, This will open further more options. By default, auto detect coin is checked. 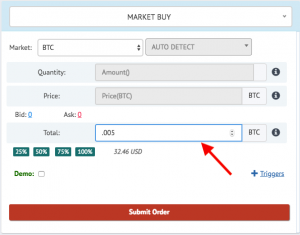 This means coin in the signal will be automatically captured and there is no need to provide quote coin in the order. [Optional] To get more control over signals, enter the comma-separated list of words which determine if order need to be executed on a captured signal. Contains – words must be there in the signal. Not contains – Words must not be in the signal. – We recommend to leave these fields empty. Enter the base coin amount that needs to be spent towards purchase captured coin in a telegram signal. This is how the final order looks like. How trailing stop buy works? I want to use one channel’s signal can it be done everytime they give signal can it be triggered – it is not for public use can you tell me, please. I am new here but this platform seems very cool. Currently, we only support public channels. Private channel support is under development. We have the option to enable repeat to catch signal multiple times. Telegram option is only available for Buy orders. I tried to set up this option, but it doesn’t work. I see it in the pop up dropdown list but can’t select it. 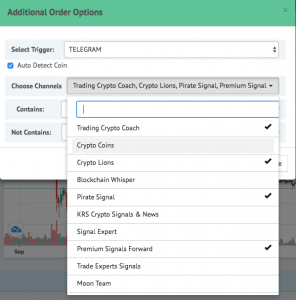 Telegram option in Trigger is currently only available in Buy Orders.